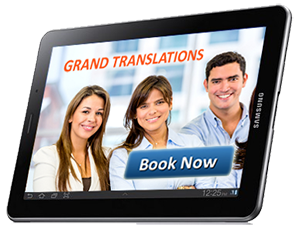 We work in 215 cities, have more than 850 qualified interpreters, follow quality standards and avilable 24/7. Our agency is well known on European interpreting market since 2008 and provides professional interpreting services in Germany, France, Spain, Italy, Great Britain, Finland, Turkey, Greece and other countries. Most of our client use this service during their visits to exhibitions, medical consultations, business conversations and city tours. During the past 6 years we have sucessfully performed more than 6000 interpreter orders from different regions of Germany, Russia, Spain, Kazakhstan, USA, France, Italy and Spain. We have geathered unique expirience in a field of professional on site interpreting, including consecutive interpreting, simultaneous interpreting and whispering. We have established close collaboration with government and privat institutions all over the world and looking forward to find new opportunities. Our key competence is consecutive and simultaneous on-site interpretation, as well as written translation and localisation from/into about 120 languages. For any important event, e.g. exhibition, conference or any type of technical event we offer qualified and expirienced interpreters around the world. We respect your choise and do our best to provide high quality standards. If you are looking for an interpreter to work with russian, german, english, spanish, french or any other european language - you are welcome, you are on the right track. We do perform all types of written translations, including website translation, text edition and correction, translation of audio and video materials of any sofistication level. We perfectly understand a value of time and therefore are available 24 hours for any urgent inquires. We interpret in more than 215 cities around the world, including Munich, Berlin, Frankfurt, Cologne, New York, Washington DC, London, Paris, Barcelona, Milano, Rome, Istanbul, Ankara, Helsinki, Moscow, Tashkent, Oslo, Kopenhagen, Vienna, Los Angeles. Our services is used by those, who pay attention to quality, punctuality and reliability. Depending on the numer of participant and the client requirements we can provide any number of consecutive interpreters. During consecutive interpreting the speaker stops every 2–3 minutes (usually at the end of every complete thought) and the interpreter then steps in to render what was said into the target language. The most important skill involved in consecutive on-site interpreting is taking motes, since only a few people can memorize fully said paragraph without loss of detail. Many interpreters use their own symbolic writing skills, which allows them to write down words in short time - this helps them to memorize and convert this to target language whithout loosing any details. This type of interpreting requires very highly level of expirience, since the interpreter speaks simultaneously as the speaker goes on. Most of the time, the interpreter sits in a booth with headphones and speaks into a microphone. Strictly speaking, "simultaneous" is a misnomer: the interpreter cannot start interpreting until he or she understands the general meaning of the sentence. This fact should make it evident how difficult the task of the interpreter really is: she or he must translate the sentence into the target language while simultaneously listening to and comprehending the next sentence. One of the important skills of the simultaneous interpreter is decisiveness: there is simply no time to weigh the merits of variant translations, or to recall just the right idiom in the target language. Any delay and a few words (and possibly a complete thought) that the speaker uttered could be lost, and since the speaker may be far away, or even in a different room than the interpreter, the loss may be permanent. What is the best way to order an interpreter? We recommend you online booking. If you are not sure which tye of interpreter you would need, you can contact us any time via phone or email us. Would you like to receive a QUOTE within one hour? Please press the button.